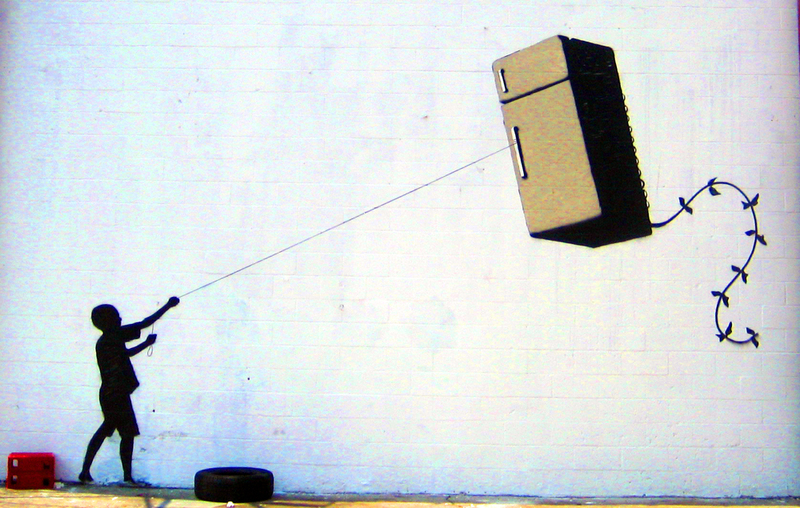 "Refrigerator Kite," a Banksy mural in New Orleans. I. In the windburned outskirts of Guatemala’s second largest city is a track of half-built homes. It is early 2008, before investors stop believing that the future lies in housing. But even now the future has cast its shadow on the development. People do not realize it yet, but the flow of capital for construction has dried up, and the rows of concrete structures partially assembled will remain that way. Still, the marketers have not yet walked away, and tall billboards throughout the city advertise the homes with images of happy families gathered around dining room tables, mothers at work in their modern kitchens. This is the first generation of housing built this way. In the older design, several families—or perhaps they are a single family; here, units are difficult to disaggregate—circled around a common hearth, sharing stews served from large communal bowls. In contrast, the kitchens on the billboards feature the requisite assets of progress: the kitchen, intended for a nuclear family, is separated from other rooms in the house, with a gas oven and a tall refrigerator. After several months of ethnographic fieldwork studying obesity at the regional public hospital, I first make my way to the housing development where a few families have begun to live. I am there to learn about what happens outside the nutrition clinic, which is a place where (mostly) women stand on scales to measure their BMI—the ratio of mass to height that correlates, according to both the United Nations and doctors in the region, to their health. The scales seem to be failing: most obviously, many are broken or difficult to calibrate; but also, they diagnose as overweight people whose narratives are filled with hunger, and the resultant advice—to eat less—does not make much sense to anyone involved. Doña Monterroso had been to the clinic several times, and we had become familiar. When I asked if I might visit her at her home, she gave me an address that brought me to the development. The nearest bus route passed some distance from her home, and then there was the walk past quiet buildings where pavement turned to gravel. Like other houses, hers was unfinished: rooms missing doors, windows covered with plastic where there might have been glass. Still, there was soup boiling on the gas stove. And featured prominently in the dimly lit kitchen was the refrigerator. While I watched Doña Monterroso carefully finish preparing the meal—which she then offered graciously to me though I had brought her nothing—I noticed the refrigerator was not plugged in, and was used only for storage. Doña Monterroso did not believe that it was capable of cooling, and whether it was or not was beside the point since this potential had no potential here. The developers’ vision reached further than the necessary cables, and electricity was erratic. Not that it mattered, since electricity was too expensive and she could not carry enough food from the market to have to worry it would spoil. Tortillas, beans, vegetables, or broth not eaten in one meal were incorporated into the next and never went to waste. The storage space was useful enough, but she hadn’t asked for the refrigerator. The number of grocery stores in Guatemala doubled in the 1990s, also transforming in character. Whereas Guatemalan supermarkets once provided high-end luxury goods, they now focus on mass-produced, processed foods. A massive store, today owned by Walmart, was a short walk from the public hospital obesity clinic where I worked. As depicted in the photograph, many of its goods required refrigeration. I would eventually meet other women with refrigerators that served to store and not to cool. And I would learn that many refrigerators come to Guatemala secondhand, arriving not through a consumer’s demand to own but through a demand to get rid of an object that no one anywhere really wants any more. Refrigerators, along with a flood of other products, are exchanged in markets where demand is a misleading term, since the demand in question is less to own than to dispose. Refrigerators, especially old and broken ones, can leak toxic chemicals, and the North Americans who once bought them new do not want to keep them around. Owning a boat in a landlocked country means something vastly different than it does in an island nation. Owning a cell phone today means something very different with regards to wealth than it did twenty years ago. The speaker is highlighting for the audience the problem that many assets used by economists to measure wealth are not useful for making global calculations since their values shift so dramatically across space and time. Most who are listening know this. They are versed in econometrics: the language of this conference and of a field of study that has claimed the title “global public health.” The room itself seems to nod when she explains that they must instead identify normal goods. Normal goods, in the parlance of this community, are goods that people everywhere are more likely to own as their wealth increases, and which can be used because of this predictability to, in her words, “anchor translations between surveys and global indices.” Normal goods, she says, make scales hang together. So boats and cell phones do not work, she says. But refrigerators do. The charts she shows correlating increased demand for them to increases in income look nearly identical whether depicting Afghanistan, Bangladesh, or the Côte d’Ivoire. Somewhere a surveyor has knocked on a door, perhaps tentatively asking the person who answers, among the other questions to be asked, do you own a refrigerator? Or maybe the surveyor can see the answer for himself and does not need to ask. He indicates yes or no on the paper he holds, then adds this to the stack of completed files that he carries by motorcycle, or bus, or even by foot if resources are scare enough, to an office where his marks are entered into computer spreadsheets. This can now be called data, the lead or ink of his encounter becoming a series of determinate zeros and ones. If the refrigerator that is counted is broken, this is not relevant to the calculations here. The problem the speaker has identified pertains not to refrigerators but to the measure of wealth itself. Wealth is crude, with many jagged edges, and it does not slide easily enough from site to site. It gets caught. It slows the statisticians down, effacing their models as it does so. “Wealth doesn’t make much sense to us,” she tells the sympathetic audience. She, meanwhile, has found a way of translating data on refrigerators into units of dollars. Unlike the nonsense value of wealth, dollars are an ideal unit to work with since they can be cleanly aggregated and disaggregated, resulting in the now self-evident scales of local/small and global/big. From there, she can produce the desired single number that can account for the value of assets across place (standardized by the unit of country) and time (standardized by the unit of year). The procedure is intricate, involving the Gini coefficient and statistical maneuvers sophisticated and skilled enough to win her the conference prize and, when she accepts it, a standing ovation. This is important work since it offers a set of tools for making values equivalent and thus comparable across landscapes that may not otherwise have much in common. It is only once equality has been established—the features of difference filed away—that they can “relate inequality back to health,” which is, after all, the theme of the conference. She reminds her audience that inequality is meaningless until it is made into a calculable unit. But once it is made measurable, there is much she can do. Using this full map and a few simple equations she can show that a country whose measure of inequality has recently increased has worse indicators for maternal health and childhood mortality. Her work offers evidence that inequality is an impediment to progress. III. These two stories both suggest that inequality links tightly to progress; but from there, the conclusions sharply diverge. For econometric calculations would have it that more refrigerators would correspond to better health, and in my work this kind of progress—and these kinds of numbers—are themselves a source of harm. The speaker seeks to convert asset data into a single measure, but refrigerators and the inequalities to which they refer are not everywhere the same. Freezing goods, from the mechanically deboned animal parts increasingly available in Guatemala to values themselves, does not enable them to travel unchanged. Refrigerators, taken by the global health community as evidence that people have been successfully inserted into the cold chains of global connection, are evidence in other communities of the very failure of these chains. The speaker measures inequality using statistical techniques capable of erasing empty spaces—filling in holes to make a whole. My research has another intention. My case—an afternoon in the home of Doña Monterroso—is neither whole nor part. Though it is necessarily partial, a story selected with other stories that could be told, it does not aspire to totality. It is not a proxy for something else. Whereas the speaker aspires to create a map that is complete, I remain unsettled by the disappearance of those never counted. Her statistics make it so these gaps are not significant (a technical term). Signification is a very different thing for me. In my work, evidence is what makes the absent present rather than what enables it to disappear. Inequality, as I encountered it in the obesity clinic in Guatemala, is not something to be calculated with a vision of equality as its opposing pole. It might be helpful to be reminded that a coefficient, the magic number upon which the speaker’s technique is based, is a multiplier of a property. It is this practice of multiplication that allows the speaker to “translate from the individual survey to a global scale” (her words) and to ultimately use a refrigerator to make claims about inequality and health. 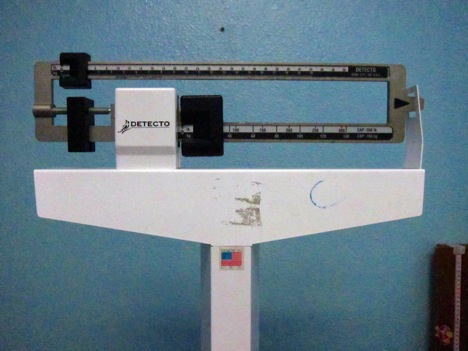 A scale in the Guatemalan nutrition and obesity clinic where I carried out my research. This is the terrain of what has come to be called Big Data, in which many small observations can be further replicated to draw big conclusions: where researchers translate between local and global scales with fast calculations. Meanwhile, in the daily life of the nutrition clinic, replication is not a good tactic. There, differences in histories and trajectories cannot be made equal, and not much comes quickly. My interactions did not translate between self-evident scales of small/local and large/global as if persons and places were units to be aggregated. In my research, scales just didn’t seem to work very well. They left people frustrated and without meaningful care. And as to the property that the coefficient multiplies? According to the speaker, asset data are “easily collected.” Perhaps there are well-trained surveyors who are capable of confronting strangers with these awkward curiosities, but these questions have never been easy for me. I did not ask Doña Monterroso if she was paying rent or owned the house she lived in, or how much these things cost. Even if I could bring myself to ask people about the price of their property, I would treat their answers cautiously. Ownership—belonging, to use a salient anthropological term—is not a simple thing. In Guatemala, it is not uncommon to enter the house of a seemingly poor woman who opens her refrigerator and shares her meal. We can make calculations of this—no free lunch, as the saying goes, all has a price. But a result of making all values of health and wealth measurable is that clinicians tell hungry people to eat and weigh less and statisticians treat toxic, broken refrigerators as assets. The expert-driven field of global health makes a powerful claim to evaluation, but as Doña Monterosso’s refrigerator makes evident, there are other forms of evaluation and expertise with less-dazzling impact, but which remain powerful nonetheless. The field of global health is hard at work gathering and assembling its data. But data are not given. They come from stories. How might global public health be changed by working hard to gather, and making space to tell, more of those? The talk is available at link. Heuts, Frank, and Annemarie Mol. 2013. “What Is a Good Tomato? A Case of Valuing in Practice.” Valuation Studies 1(2):125–46. Law, John. 2004. “And If the Global Were Small and Noncoherent? Method, Complexity, and the Baroque.” Environment and Planning D: Society and Space 22(1):13–26. Martin, Emily. 2007. “Manic Markets.” In Bipolar Expeditions: Mania and Depression in American Culture, 234–68. Princeton, NJ: Princeton University Press. Merry, Sally Engle. 2011. “Measuring the World: Indicators, Human Rights, and Global Governance: with CA comment by John M. Conley.” Current Anthropology 52(S3):S83–S95. Pigg, Stacy Leigh. In Press. “On Sitting and Doing: Ethnography as Action in Global Health.” Social Science & Medicine. Available at link. Strathern, Marilyn. 1999. “Puzzles of Scale.” In Property, Substance, and Effect: Anthropological Essays on Persons and Things, 204–25. London, New Brunswick, NJ: Athlone Press. Walter, Maggie, and Chris Anderson. 2013. Indigenous Statistics: A Quantitative Research Methodology, 159. Walnut Creek, CA: Left Coast Press.